Today its my day over at Timeless Twine Blog... I wrote my last post as TT DT. ...so here is my project for welcoming 2014. As my daughters are too young for adult beverages I got them a bottle of sparkling Apple cider for the new year's toast and made a cute tag for it. I used Razzleberry Sorbet and Aqua Blue twines for this project. I heat embossed the image using white WOW! 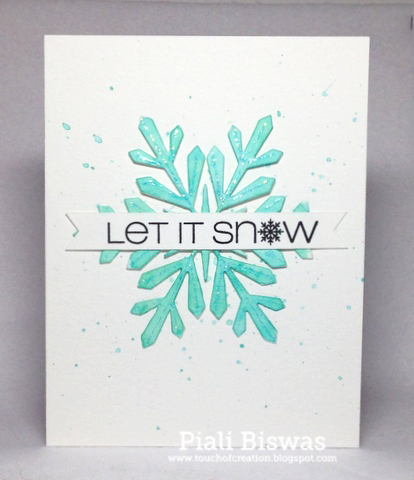 Embossing powder...then used my versamark pen to embossed the other parts with various colors of Wow! Embossing powders. Cut it Up-: New Year's celebration. Wish you all a very Merry Christmas!!! Hope you all are having a wonderful day!!!! I had super busy week....lots of gift wrapping, lots of baking & cooking....and tons of fun!! I love Christmas , its the best time of the year....sharing cards, gifts and baked goodies makes me super happy!! Hubby took my girls for a movie so its quite here , I thought of sharing a quick post with some CAS cards with you all. 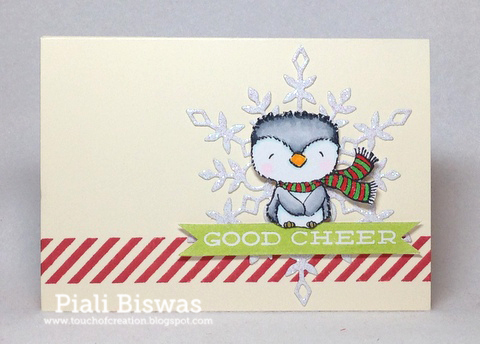 I used Hero Arts wreath stamp stamp for this CAS card, sentiment is from Stampendous. I made a bunch of them for my friends... kept it super flat for mailing just added some red stickles and gold shine spray. 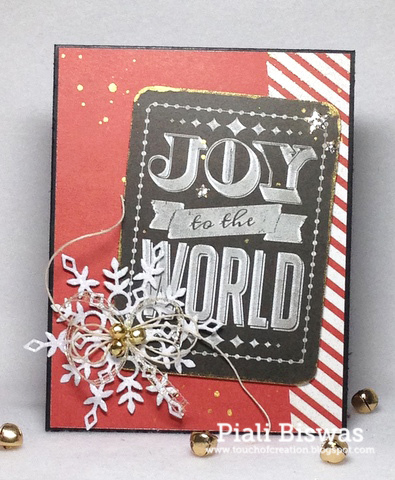 I used Tim Holtz stamp for the holly ranches and the sentiment is from CASual Fridays stamps. Again kept these cards pretty flat too...with some red stickles and gold color shine spray. Holly Jolly Christmas Challenge: Christmas. Labels: cas, casual fridays stamps, christmas, hero arts, holidays. Its my day over at Timeless Twine blog! 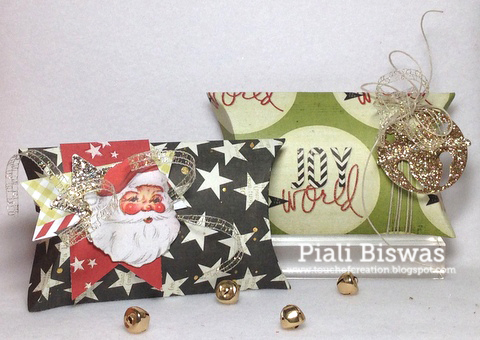 Today I shared a pretty gift packaging idea . I love the Firecracker Twine's color combo...I picked my projects colors to match the twine. I used stamps & tag dies from Reverse Confetti . The large snowflake die is from Hero Arts. You can find the project instructions ..HERE. Totally Papercrafts: Christmas with non-traditional colors. 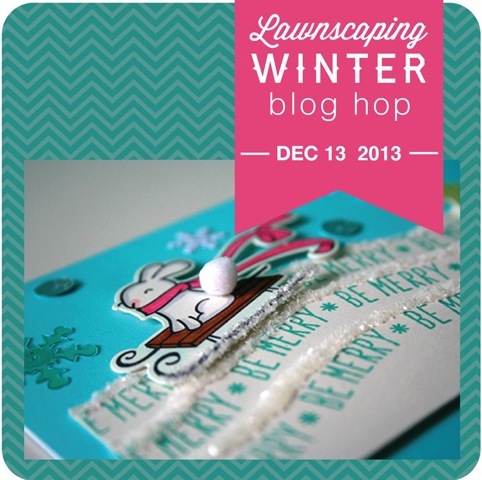 Welcome to Lawnscaping Winter Bloghop.. If you here from Christy's Blog you're right on track, if you are just joining me now please visit Lawnscaping blog to start from the beginning. You don't wanna miss anything. there are lots of prizes to win and tons of inspirations too! Perfect for this time of the year. I ♥♥♥ Lawn Fawn stamps..somehow I don't have any winter themed sets( note to self-- get more Lawn Fawn). I do have some fab winter flairs...yay!!! I designed my card around the flair. I used one of my favorite Lawn Fawn border stamp from Interlocking Backdrops. The lovely Flair button is from Peace Joy Love collection. 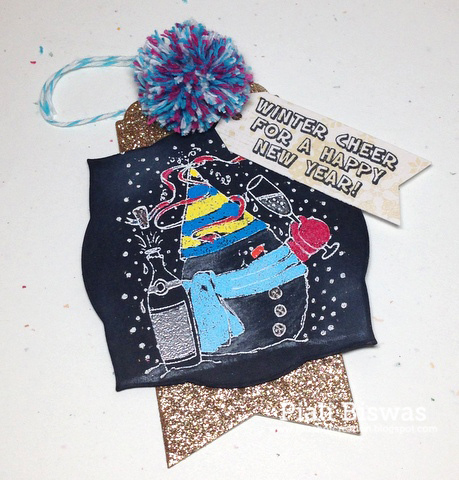 I used Hero Arts snowflake die and some sequins and my fave Color Shine Gold spray for this card. Fab 'n' Funky : Snowflakes. Crafty Little Fairies: Let it snow. CAS-ual Fridays : Let It snow. 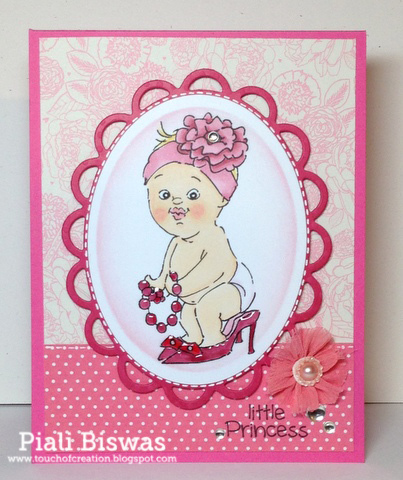 Today Michele is featuring my cards over at Casual Fridays Stamps blog. Here are my CFS cards..
Do you remember this Sentiment...its my favorite one!! The sentiment is from CFS-Snowflake Greetings. I love the pretty snowflake in place of the"o". The lovely snowflake die is from Hero Arts. Cards und More : 10 minute cards. Craft Your Passion: Let it snow. CAS 4X4" cards...will great on some gifts .Its flat enough for mailing too. I used CFS-Funky Square Tag die to cut the squares. Then used CFS-Out Loud to create the text background...♥ this set. I heat embossed the background and then sponged the squares with Peacock Feathers and Mowed Lawn distress inks. You can tell by now that I'm in love with Heidi Swap Gold color shine...I'm using it on almost every project. I stamped the sentiment on Doodlebug DP. The sentiment is from CFS-Christmas Carols. Just embellished my mini cards with some sequins and wood veneer trees! 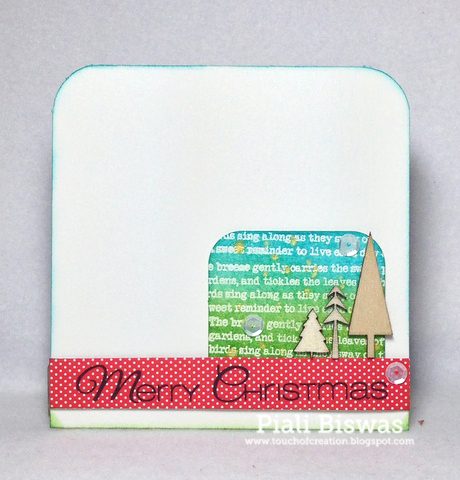 Sweet Stamps : Simple Christmas. Make sure to check out CFS Blog for more holiday inspirations. Labels: cas, casual fridays stamps, CFSDT, doodlebug designs, holidays. Its snowing here!!! Everything is covered with white fluff!!! Kids have Early Dismissal today..a quick post before they head home.. I have a few holiday things to share. 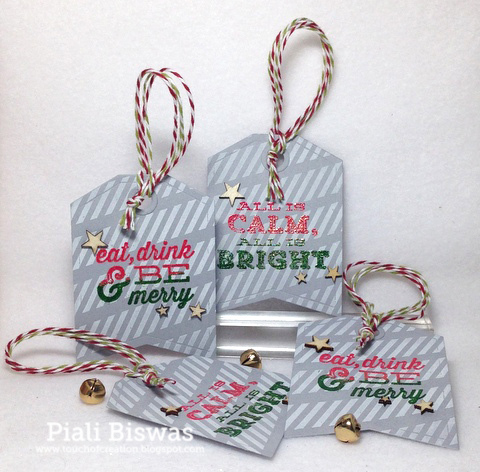 I made a simple tag set using Purple Onion Designs- This is December . 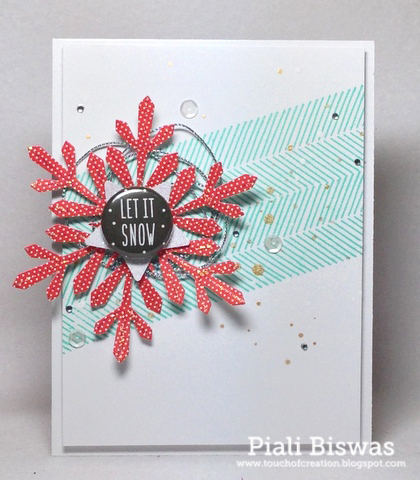 I heat embossed the sentiment with two colors of WOW! Embossing powders. The Timeless Twine- Baker's twines are the perfect thing for this tag. The tag die is from Reverse Confetti. 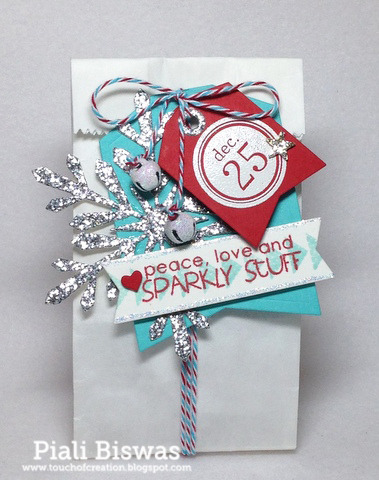 Sparkle N Sprinkle : Anything goes with Glitter/Embossing powders. Make it Monday : Anything Goes. Dream Valley Challenges : anything But a card. I used POD-Willard Sipping Cocoa, Campfire & Have a warm & toasty one stamps. The patterned papers are from American Crafts. Created With Love Challenges : Anything Goes. The Corrosive Challenges: Anything Goes. That Craft Place : Christmas. 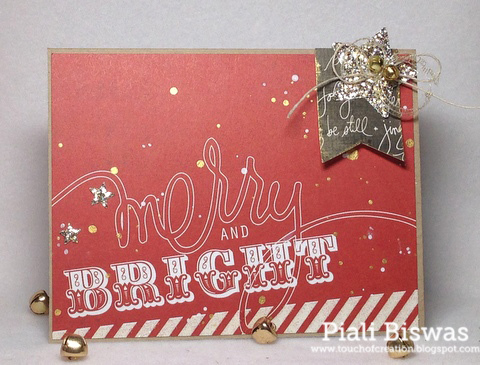 Next up is a CAS holiday card with a fab Sentiment font!!! 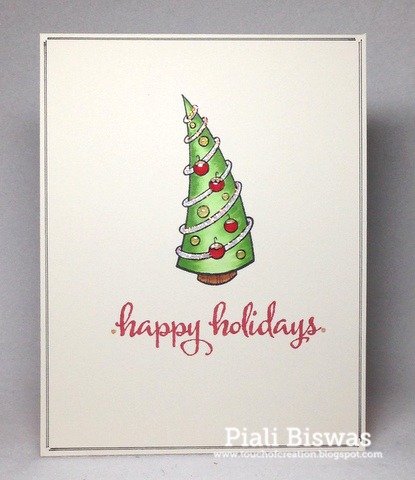 Love this sentiment font from the new release...POD- Scripty Holiday Sentiments. Just a little stickles and glossy accents...Easy Peasy!!! Anonymous Stamps Challenge: Anything Goes. 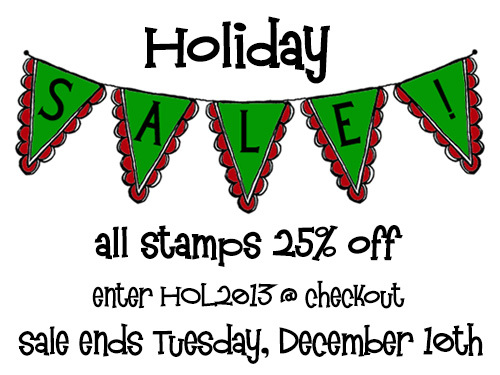 Today is the last day of Purple Onion Designs sale... get your favorite stamps Now!!! Welcome to Crafty Chicks December Blog Hop!!!! As many of you know now that every month we have a themed blog hop for you all with prizes. No stamping at all...an entire card set from a paper pack!!! Love this paper pack from Heidi Swapp... called Believe. Just added my favorite snowflake...its a die from Simon Says Stamps. I used the journalling card for my sentiment. Love this Santa face...I trimmed it from the paper pad. I ♥♥♥ the Heidi Swapp Color Shine Gold spray...its amazing!!! A Creative Romance: Sparkle at Christmas. Sister Act Card Challenge: Anything Goes. I love making pillow boxes...as it holds a gift card and some little goodies. I also used the MayArts ribbons. I used the bell die from Lil' Inker Designs. Hope you all like my projects!!! 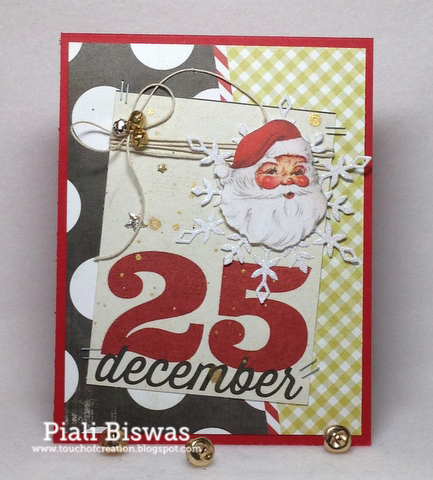 Totally Papercrafts: Anything Christmassy but card. 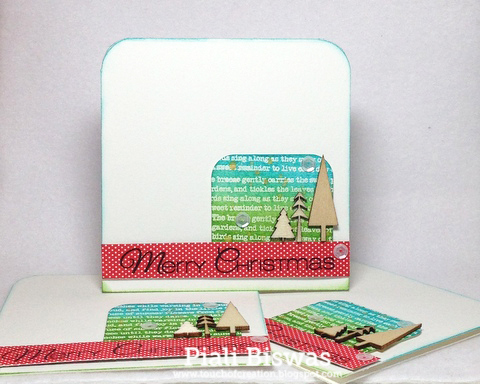 Labels: bloghop, crafty chicks, Giveaway, holidays. Today we're releasing the new Ai Babies stamp series. Please check Ai blog for the bloghop details . ...and here is Little Monster. Aren't they all so cute???? Hope over to Ai Blog to start the hop. A quick post with some Holiday Gifts!! Did all decorate your Tree already??? I just started today...will finish tomorrow. Now its time to put the presents under the tree...so here are some gift ideas!! ♥♥♥ this Shadow box... it will make a cute gift!! This shadow box is for the following challenges..
Crafting When We Can: Winter. 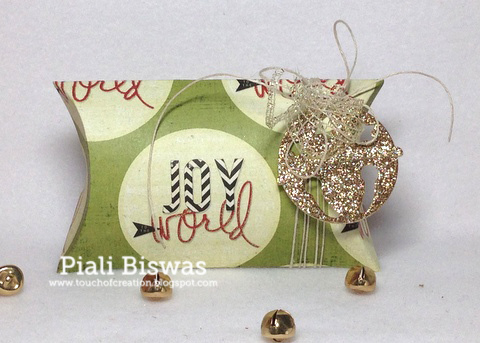 One of my favorite thing to gift is Gift Cards...so here is another gift card holder. 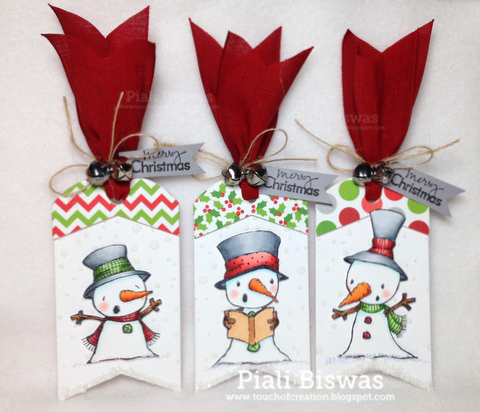 I used POD-Frost and This is December stamp sets. I♥♥♥ THIS IS DECEMBER set...its a BIG set with lots of fun Holiday images, its a holiday must have. Its cute , Isn't it??? 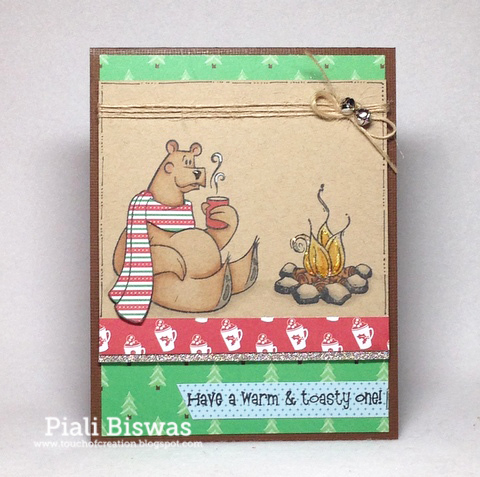 This gift cardholder is for the following challenges..
Time 4 Scrap : Christmas with Animals. 613 Avenue Create : Anything Goes/gift packaging. Sentimental Sundays: Traditional Christmas Colors. Check out POD Blog for more Gift Ideas!!!! 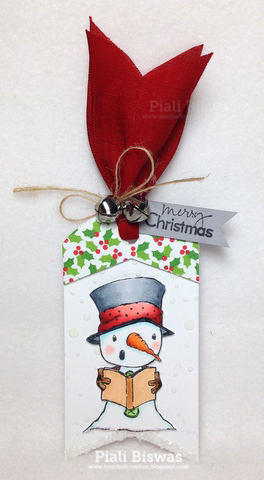 I used cute holiday stamps from Purple Onion Designs. First up is a super cute tag set..
Lots of fun texture going on ere with the embossing paste, glass glitter, lovely May Arts Ribbon & more. 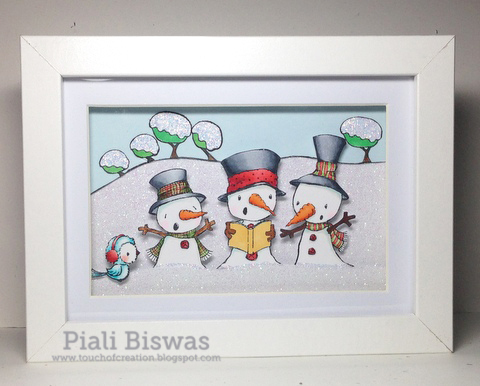 Cute Snowmen are from POD-Snowy Trio stamp. The sentiment is from POD-Handwritten Holiday. 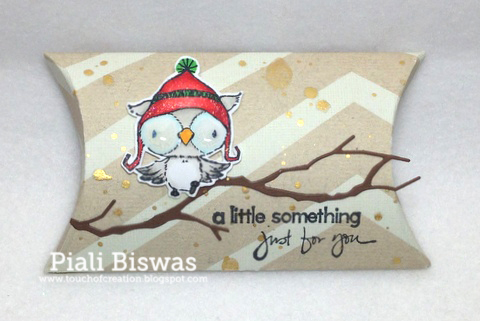 I used individual images for my tags, its a great way to stretch your stamps. Gives a totally new look!! Colored the images with Copics . The cute holiday papers are from Doodle Bug Designs. 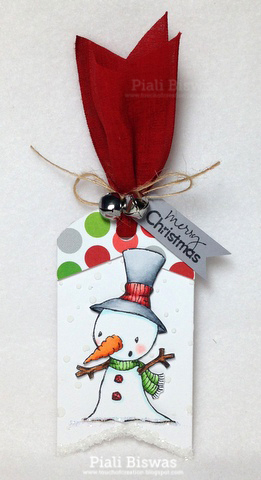 Card Crafter's Circle: Gift Tags. Copic Marker Europe: Anything Christmas. 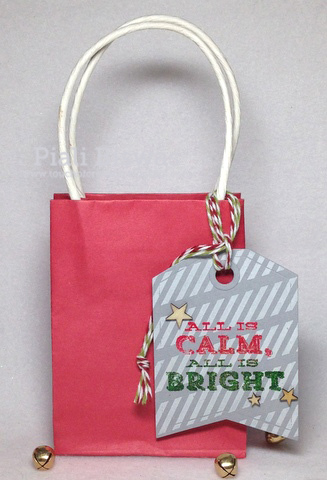 Crafty Ribbons: Anything goes with Christmas. Crimbo Crackers: Anything but card. Annabelle Stamps Challenge : Christmas. 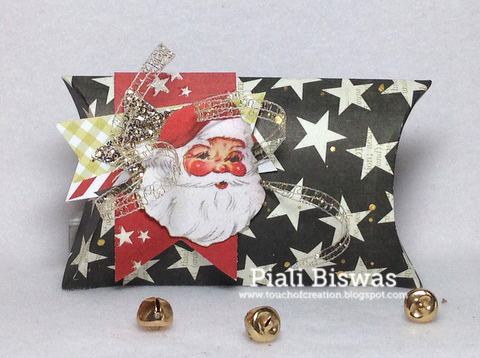 Next up...is a another cute pillow box, it can be used for gift cards or candies or jewelry. 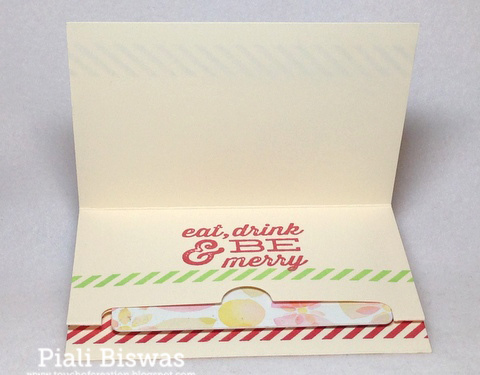 The sentiment is from POD-Handwritten Holiday, this set is a must have! I used some Heidi Swapp Gold color shine...its Gorgeous, great shine. This gift box is for the following challenges..
Hanna & Friends: Little Presents. Inky Impressions : Presents & Gifts. I will be back tomorrow with some more holiday projects. 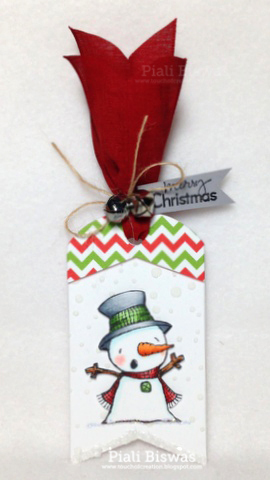 For more gifts and tags inspiration check POD Blog.